Peak Warming Man wrote: And then what happened. I've found the manual but still haven't read it. Rat lungworm: Not only for rats. 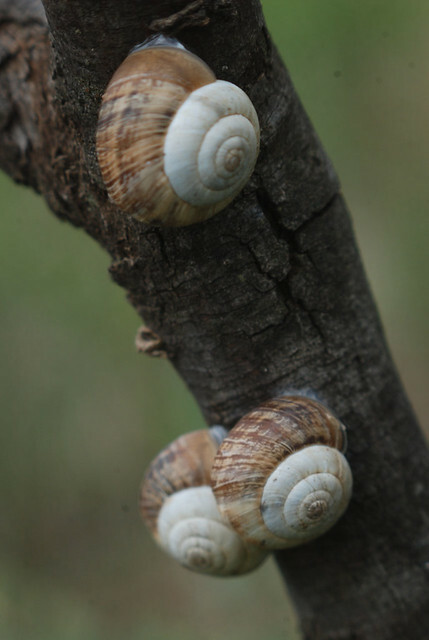 Around 5% of common garden snails in and around Sydney contain larvae of the parasite Angiostrongylus cantonensis, commonly known as the rat lungworm. It is probably more common in Brisbane and is seen on the coast from far north Queensland down to Jervis Bay. Yes. I remember being warned. However, I don't really have the garden snails anymore. I may see a couple a year but I'm sure they are coming from next door. Is the parasite also found in the white snails? If you mean Theba, yes, it is found in those snails. Helix wrote: If you mean Theba, yes, it is found in those snails. 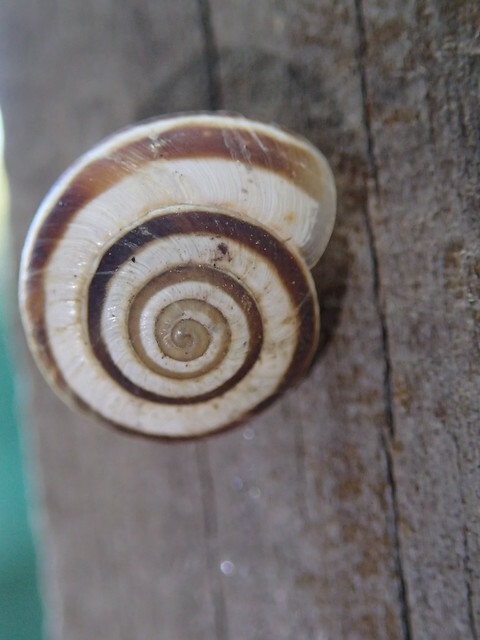 After looking, I have conical snails and white snails and a brown and whitish striped one so perhaps I do have Theba pisana, Cernuella virgata and Cochlicella barbara? 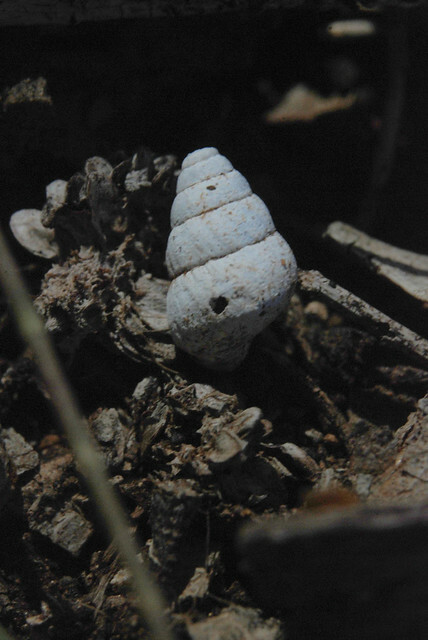 The round snails are probably Theba pisana. It can be tricky to distinguish between T. pisana and Cernuella virgata because their shells are similar in size, shape and coloration. Cernuella tends to being more stripey, but it's not a sure fire way to identify them. The best way to tell the two species apart without dissection is to look at the underside of the shell. The umbilicus differs between them. In Theba pisana, the lip partly covers (occludes) the umbilicus. 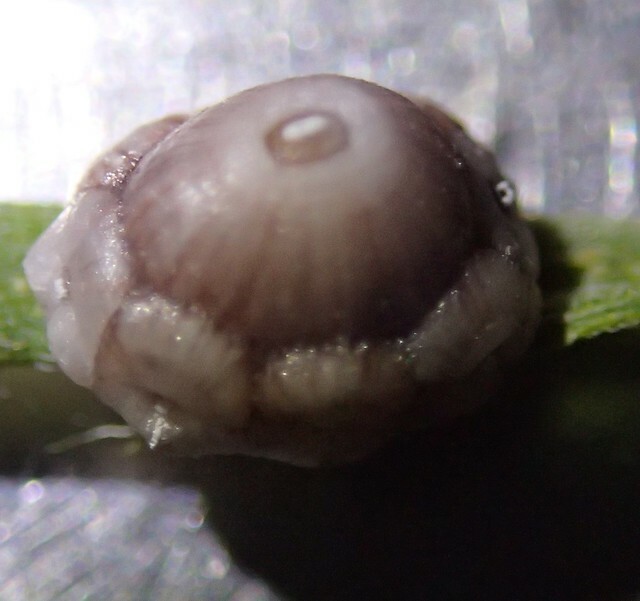 In Cernuella virgata, there's no such occlusion. It was a good read, I only vaguely remember reading about this before. Interesting. So you have to consume the snail to transfer the worm? nut wrote: So you have to consume the snail to transfer the worm? That and not wash the snail shyte off the lettuce leaf or indeed lick up the slime trail. and thanks Helix. Here's some stripey ones. ETA: I can't get hold of the papers from MJA, but this page in Microbiology has the info. Thanks you. It is good to be a little more aware :). Interesting. I've been very unwell the past few days. Still unwell but seem to have got through the worst of the symptoms. Still have very bad lungs and throat. It came about almost immediately after opening a box of watch hands that had been in my shed workshop. Of course I sorted them and picked out the pair I wanted with a watchmakers loupe, which means my nose was in very close proximity of the box which had been subjected to a rodent raid some time back. The whole room had been ransacked by rodents some few years ago and I'm slowly retrieving stuff from there. roughbarked wrote: I've been very unwell the past few days. Still unwell but seem to have got through the worst of the symptoms. Still have very bad lungs and throat. It came about almost immediately after opening a box of watch hands that had been in my shed workshop. Of course I sorted them and picked out the pair I wanted with a watchmakers loupe, which means my nose was in very close proximity of the box which had been subjected to a rodent raid some time back. The whole room had been ransacked by rodents some few years ago and I'm slowly retrieving stuff from there. Yeah, unlikely but very bluddy crook anyway. roughbarked wrote: Yeah, unlikely but very bluddy crook anyway. If you're that bad, perhaps you should take yourself off to see a quack. "“Typically, zebra finches will lay one egg a day for about five days, and will only start to incubate their eggs on the day that the last egg is laid”, said the study’s first author, ecologist Simon Griffith, leader of the Avian Behavioural Ecology group at Macquarie University. Eggs laid earlier in the sequence are left unattended in the nest where they are exposed to ambient atmospheric temperatures. Typically, these temperatures are low enough to prevent embryonic development until incubation commences on the day when the last egg is laid. “This way, all the eggs incubate and hatch at the same time in the nest, making it easier for the parents to feed and look after the chicks evenly”, said Professor Griffith in a statement. However, if eggs are exposed to temperatures that are warm enough to trigger embryonic development before incubation begins, they will hatch over a period of several days. The first chick to hatch will be able to monopolise the food provided by its parents, potentially reducing the survival of its younger and smaller brothers and sisters. That - to me - sounds very over simplified and no conclusions can be drawn from the study. Looking through HANZAB we see that the Zebra Finch breeds across a huge range. Its populations are subject to large scale change and has almost certainly been influenced by land use change and the ('artificial') availability of water. 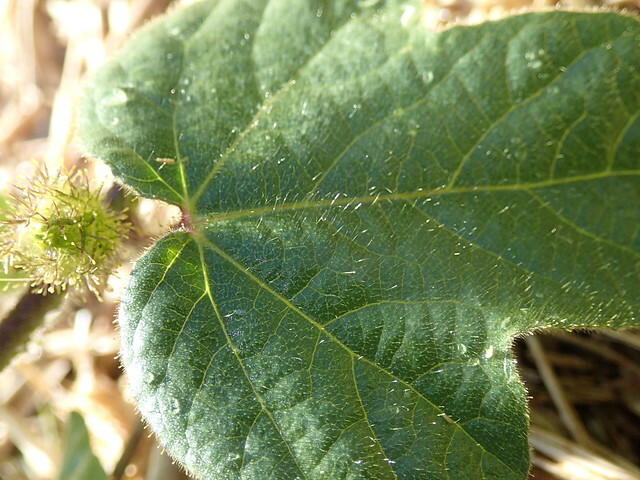 Its breeding habit show little correlation with rainfall or temperature but more with availability of seed; inversely correlated (perhaps limited) with minimum temperature. At a little over 30 degrees parents do not incubate. It is quite natural for eggs to hatch on successive days or synchronously. Some thoughts: it could be argued that given the parents limitation to only lay eggs over a given time, that the shortest possible time to fledge would be a survival advantage? Lowest predation? Delaying development of the first laid eggs for additional days so that they hatch at the same time increases predation days? So I say oversimplification. I call baloney. I say direct interference through land use change does and has far greater influence. I walked out the back door to find a box of books. All dusty. A neighbour must have dropped them there. in it were a lot of orchid books including Australian Indigenous Orchids Volume 1 by A.W. Dockerill. More's the pity that other volumes were not in the box but hey, why look a gift horse in the mouth? "These conditions damage a wide variety of species, particularly invertebrates, such as snails, limpets and corals, although tide pool fishes are also harmed." Yet another Queenslander imported in weed suppressing sugar cane mulch. 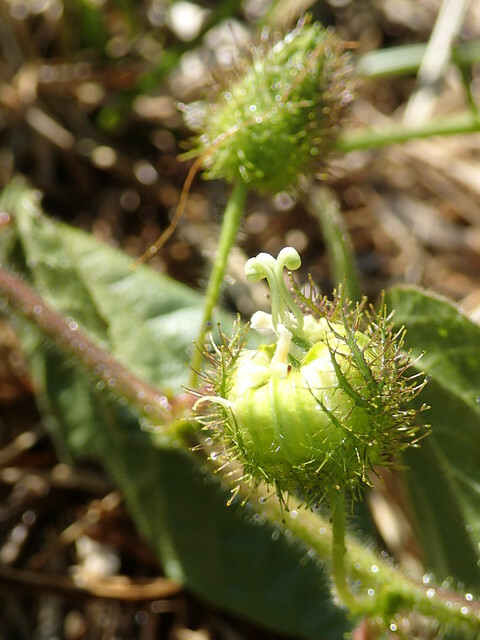 Hairy twining thing with tendrils. Could be Passiflora Foetida - Stinking passionflower. fsm wrote: Could be Passiflora Foetida - Stinking passionflower. Yep. That would be my guess. Well, it is dead. Has been from shortly after the photo was taken. Harry and I are back from a top excursion into spectacular country. We joined this bunch; worked hard and/but loved it. It was my most "outback" effort so far and the driving through the Gawler Ranges was a bit (ha!) taxing, but worth it. I think I read way back a while ago that you'd nearly forgotten how to use your camera, nut. That would be two of us, iirc. Hey JJ. Hope you are great. I really should try a little harder concerning the use of my camera. Yes I'm fine, thank you and trust you are too (and everyone else as well). I am making hard work of more things as time goes by, but am loving being able to do so much that I enjoy. Each trip I make in ALF I add a couple more things I have learned (sometimes the hard(er) way ... but it is all good. I am shortly to take delivery of a smallish trolley jack ... ALF fully loaded is very heavy, so am making it a bit easier on myself after having to get a small bottle(?) jack hard to balance/work on a gravel road up near Yardea. Was very lucky to have another car stop and help with lifting the spare into proper place UNDER ALF. I had changed they tyre but tweaked my back a bit trying to get the damaged tyre up into the special place. Once I have the new jack I will be able to raise the back safely to slide the spare onto the frame that holds it much more easily, then use the little jack to lift the frame (with tyre) up nice and steady to screw it into place ... and not HAVE TO travel with it IN the vehicle. How's that for a comprehensive report?! Hi jj. :) great to see that you are enjoying the work and the fun. I'm not so sure that a trolley jack is safe to use on any but level floors unless it has legs that disable the wheels. I'm sure you're right, rb ... it's a bit of a no win situation but I will at least have both on board. 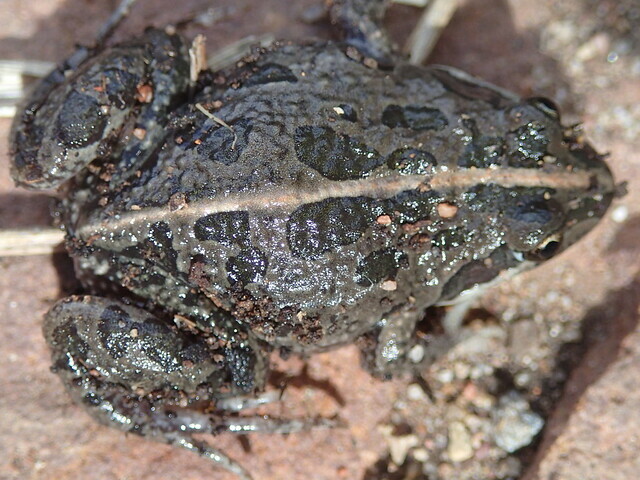 The app includes around 1,100 species, accompanied by over 3,000 images. justjj wrote: I'm sure you're right, rb ... it's a bit of a no win situation but I will at least have both on board. Carry something to chock the wheels of the trolley jack? I went for a paddle at Lake Wartook this afternoon. It's nice though a bit shallow in places at the moment. I don't have any real pictures but this was taken with my phone and made a 'nice' black and white. Hope everyone is well. "How's the serenity? So much serenity!" It's been a while since a crazy ant update. We now have two sites totalling around 30Ha that are on the count down to be able to declare eradication! The larger areas need a load more resources. Thankfully we're getting a lot of support from some excellent lobby groups. The feds have said that they have some money for us, but haven't put a figure on the table. The state has put $3 million on the table, but it's a long way short of what we've asked for. In between, there's an election which may make a mockery of all the lobbying that's been done. In the mean time, we keep on fighting the good fight, under resourced and overworked. I do like your photos nut ... and fsm; I saw some aboriginal rock markings at Hiltaba ... just cannot shake an overwhelming sadness about all that destruction / loss. Your news is really encouraging Teleost ... despite possible limitations on support ... so many things not getting any recognition / support. I got my quote for going off grid ... it is on the WayBack burner ... I won't live long enough to have it make any kind of economic sense (or environmental, for that matter), but I was keen to find out. $50 grand ... I'd thought half that, tbh, but had no real idea. It turns out that I'd need as many solar panels again as I already have. Those I have had for 6 years now (I think) will have paid for themselves in another year, which is good enough for me. I COULD use a solar hot water unit to good effect, but ... other priorities I guess. I did the fair thing and told them I thought I'd not be able to go ahead with it but was on a "want to know" mission; they were happy with that. In the meantime I am contributing to the destruction of the red gums in NSW by buying occasional firewood as my own won't stay alight all night. Signed: Vandal that I am. Engineers at the University of New South Wales (UNSW) have set a new world record for the amount of energy solar cells can get from sunlight. A university spokesman said the solar cell efficiency achieved in the study was about 44 per cent better than the previous record of 24 per cent, held by a US solar cell company. Professor Martin Green, the director of UNSW's Australian Centre for Advanced Photovoltaics, said the level of efficiency achieved by the new configuration was not expected to be improved on for years to come. "A recent study by Germany's Agora Energiewende think tank set an aggressive target of 35 per cent efficiency by 2050 for a module that uses unconcentrated sunlight, such as the standard ones on family homes," Professor Green said. "So things are moving faster in solar cell efficiency than many experts expected, and that's good news for solar energy." The solar cell configuration works by splitting sunlight into four separate bands. Different parts of the cell with different layers then absorb the different bands of sunlight, with different materials optimised for maximum efficiency. And while these "multi-junction" solar cells would not be found in your typical solar panel due to their cost to manufacture, the team from UNSW said they were working on ways to bring the cost of making the cells down. It is thought that the theoretical efficiency limit for a device like the one used to set the new world record was 53 per cent. "This encouraging result shows that there are still advances to come in photovoltaics research to make solar cells even more efficient," senior research fellow with the Centre for Advanced Voltaics Dr Mark Keevers said. "Extracting more energy from every beam of sunlight is critical to reducing the cost of electricity generated by solar cells as it lowers the investment needed, and delivering payback faster." I went fishing in my kayak and heading back it was an interesting sunset but that is not quite its context. Earlier I was thinking of heading out to Wartook in the Grampians but the weather was a bit suspect so I took the less adventurous option and just headed to the Lake. When I arrived I realised the shoes I normally wear in the yak I had left at home so I went with naked feet, I also wear shots in my yak. It was a bit chilly and the water was pretty cold but not uncomfortable. I had a paddle and fished a bit with no success which is pretty normal. I worked my way around the Lake and at one point near some overhanging branches I draw back the rod and cast but the lure had caought on the branches and my baitcaster turned into a huge knot. It was still a bit early to head back so I paddled over to a wind protected spot and tried to untangle the line but ended up cutting it away. It took a little while and I realised that I was becoming quite cold. I tried a few more casts but gave up and headed back hoping to get a bit of blood flowing, and more, a bit of warmth. Brilliant photo. Hope yopu took your knotty fishing line home with you. roughbarked wrote: ... Hope yopu took your knotty fishing line home with you. Just another at the Lake. Taken about ten minutes early when I was still closer to the trees. Galaxy S4, this shot is a single shot cropped where as the other was five images stitched with Hugin. Yet another lovely photo. I love sunsets and sunrises. They change so much as they pass. I haven't been getting out so much, being working fulltime as a watchmaker at present. All my spare time is taken up with home and garden maintenance. 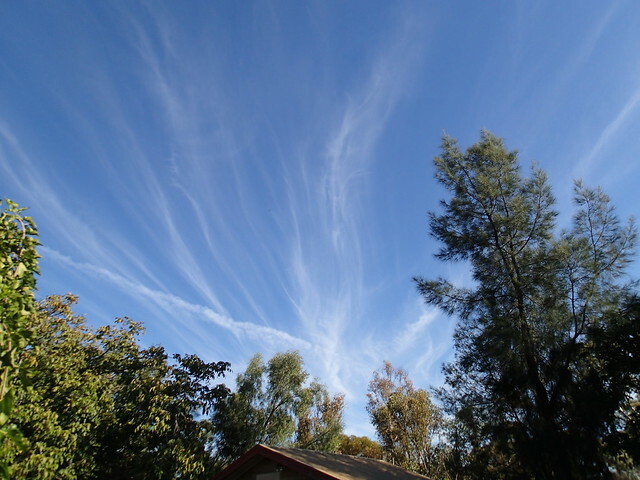 Here's a shot of the sky from the backyard.